I love chocolate chip cookies, but only if they are soft and chewy. Please don’t ever give me crispy cookies. I’ve been looking for the right cookie, you know, the one that makes you smile when you bite into one. Good news, I found it! These cookies are big, soft and chewy. There is a saltiness to them that makes the sweetness come alive and sing in your mouth. I start skipping around the house when I make these cause they make me so happy. Did I ever tell you that my mother always said I was a bit dramatic? I didn’t? Well, she did and she said one day I will win an award. Mom, I’m still waiting for that award. Try making these cookies and you too will skip and sing around your house. If you are not using unbleached all purpose flour, you need to start using it. Unbleached all purpose flour works the same as regular all purpose flour but doesn’t have the chemicals that make it bleached. 1. Adjust the oven racks to the upper and lower middle positions and heat the oven to 325 degrees. Line 2 large baking sheets with parchment paper or spray them with nonstick cooking spray. 3. Either by hand or with an electric mixer, mix the butter and sugars until thoroughly blended. Beat in the egg, yolk, and vanilla until combined. Add the dry ingredients and beat at low speed just until combined. Stir in the chips to taste. 4. 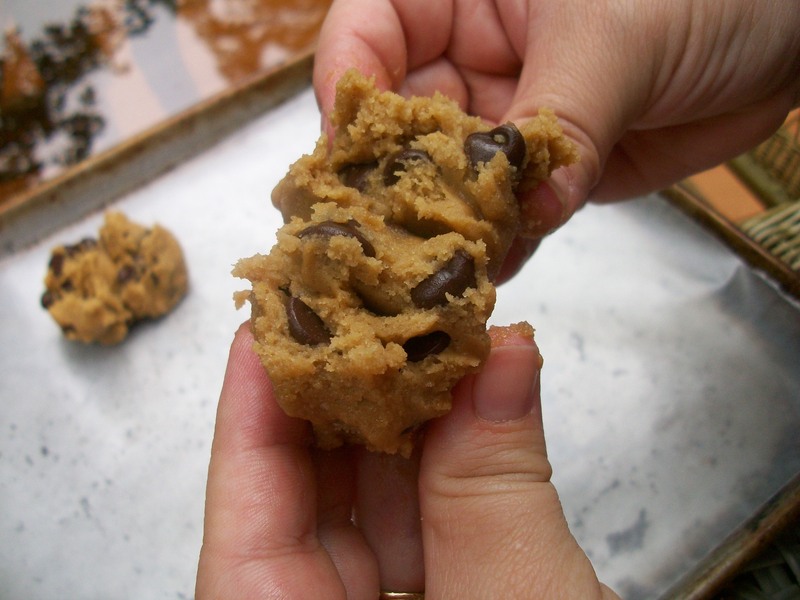 Roll a scant ¼ cup of the dough into a ball. 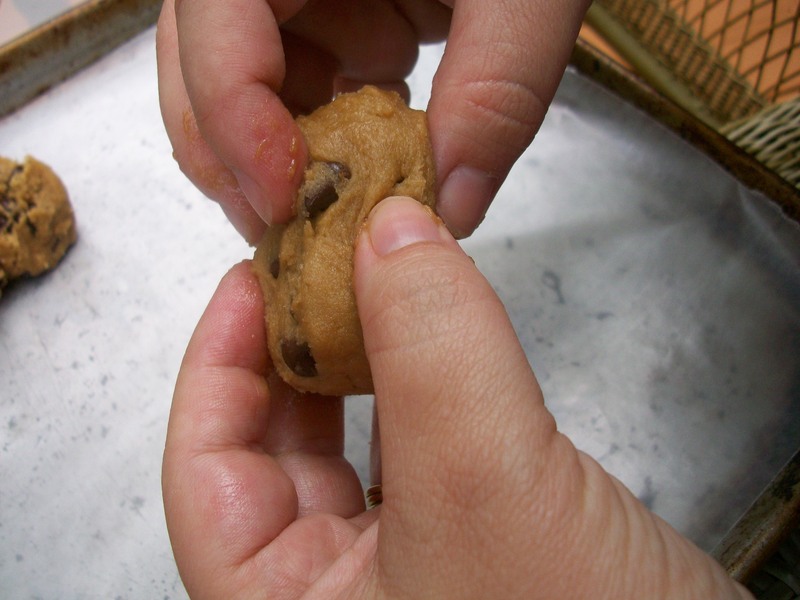 Hold the dough ball with the fingertips of both hands and pull into 2 equal halves. Rotate the halves 90 degrees and, with the jagged surfaces facing up, join the halves together at the base, again forming a single ball, being careful not to smooth the dough’s uneven surface. Place the formed dough balls on the prepared baking sheets, jagged surface up, spacing them 2 ½ inched apart. 5. Bake until the cookies are light golden brown, the outer edges start to harden, and the centers are still soft and puffy, 15-18 minutes, rotating the the baking sheets front to back and top to bottom halfway through the baking time. Cool the cookies on the sheets. Remove the cooled cookies from the baking sheets with a wide metal spatula. Hello Geni, it’s nice meeting you. Thank you for visiting, I hope you stop by more. I saw your blog and yours is great. I love finding new foodie blogs.